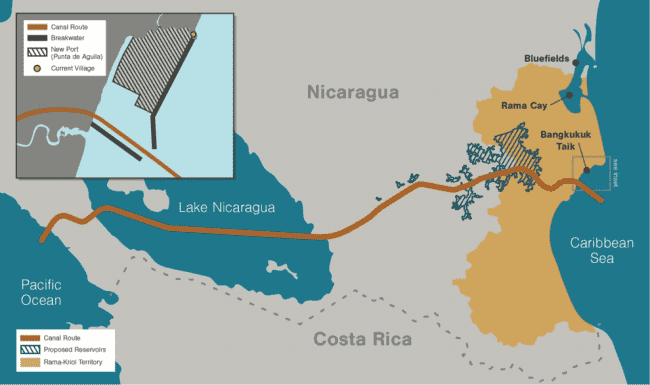 The Nicaraguan government in tandem with the Hong Kong Nicaragua Canal Development Investment Company (a small company owned by Chinese entrepreneur Wang Jing with no known knowledge or experience having been created in 2012) seek to develop, construct and operate a $40 billion USD canal across Nicaragua. The proposed canal would compete with the Panama Canal by connecting the Pacific Ocean to the Caribbean built through indigenous Miskitu, Rama and Rama Creole territories with the Peoples’ Republic of China becoming the primary beneficiary for shipping transport. The Indigenous nations object to what they consider to be a fraudulent project authorized by the Sandinista controlled Nicaraguan government that will devastate their ancestral territories, undermine their cultures and impoverish their peoples. What is a well recognized as a canal development project doomed to financial and environmental failure as well as cultural destruction of major proportions if it is carried out has no credible support for actual management, operations or funding except with the possibility of hidden support from China. Some observers have noted, “the Nicaraguan Canal will begin as an unproven entity, without being able to compete on price against established routes through an existing canal that is seen to function relatively well”. The Panama Canal and the circumnavigation of the southern tip of Africa are both recognized as sufficiently economical for global trade. Only China’s interest in very large, so called Panamax ships, too large for the Panama Canal would seem to justify building this canal. And, it might be further noted that simply constructing the canal without any profitable future will benefit Daniel Ortega and his partisans ensuring the wealth for generations. In addition, if this is truly a Chinese government project hiding behind Nicaraguan greed, then it would be a clear economic and geostrategic benefit to Chinese influence in South and Central America. The Center for World Indigenous Studies worked with other organizations and in particular with MISURASATA throughout the 1980s to ensure the political and cultural integrity of the Miskitu, Sumu and Rama nations against the decade long attacks by Nicaragua’s Sandinista government that had killed more than 10,000 indigenous people defending themselves. The Sandinistas have gained authoritarian control over Nicaragua and have been pursuing development policies advancing Sandinistas’ personal enrichment at the expense and destruction of indigenous nations. The Miskitu, Rama and Rama Creol nations have for years sought to defend themselves against Nicaraguan plundering, and ravages against them and have now moved to seek international sanctions against the government of Daniel Ortega. The Government of Nicaragua headed by Daniel Ortega failed to respond to a multi-national challenge before the Inter-American Commission on Human Rights where his government is charged with attempting to confiscate indigenous Miskitu, Rama, Rama Kriol territories for private benefit and benefit to the government of the Peoples’ Republic of China. Nicaragua and China seek to arbitrarily take lands and resources in the ancestral regions of indigenous Miskitu, Rama and Kriol peoples to build the Grand Interoceanic Canal of Nicaragua in complete disregard of the internationally recognized principle that indigenous peoples must first exercise their consent on all matters affecting their interests. Nicaragua has ignored its duty in accord with the UN World Conference on Indigenous Rights (2014) where it agreed to respect the principle of free, prior and informed consent to state government actions affecting the interests of indigenous peoples. 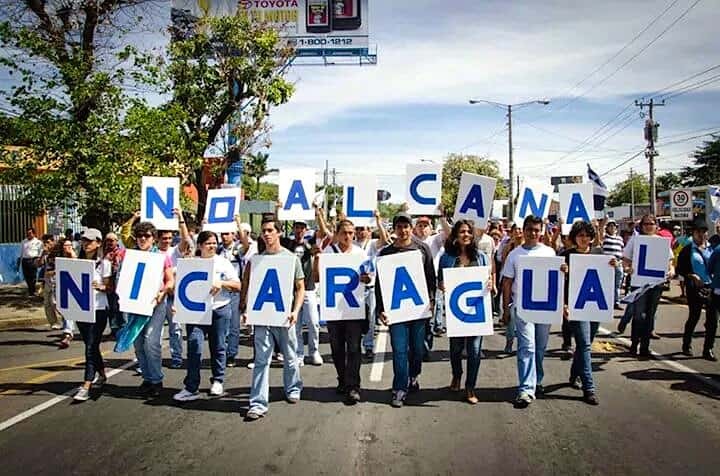 Absent Nicaragua’s response to a petition presented by indigenous governments to the Inter-American Commission on Human Rights demanding that Nicaragua submit to the internationally established principle, the Commission has opened a case against Nicaragua. On June 25, 2018, Steve Martin Cuthbert, a member of the Indigenous Miskitu people of Tasbapounie; Rupert Allen Clair Duncan, a member of the Kriol ethnicity, president of the Monkey Point Communal Government, and member of the Rama-Kriol Territorial Government (GTR-K); Santiago Emmanuel Thomas, a member of the Indigenous Rama people and member of the GTR-K; and Nora Newball, coordinator of the Bluefields Creole Communal Government (GCCB) were notified that the Inter-American Commission on Human Rights (IACHR) has opened Case No. 13.615 due to the State of Nicaragua having failed to present a response to their petition against the Grand Interoceanic Canal of Nicaragua (GCIN). Additionally, the IACHR is making itself available to both parties with the aim, if possible, of arriving at an amicable solution. The case has its origins in Nicaraguan President Daniel Ortega’s presentation of the bill that would become Law 840, which grants a no competition concession for the GCIN to the Hong Kong Nicaragua Canal Development Investment Co., Limited (HKND), without a bid, without the required consultation, and, therefore, without the free, prior, and informed consent required by Indigenous and Afro-descendant peoples. This arbitrary action attempting to appropriate lands in violation of international norms was enacted even though 52% of the planned route of the GCIN passed through territories that are the historical and ancestral territories of the indigenous peoples located in the Southern Caribbean Coast Autonomous Region (RACCS). The State of Nicaragua issued a title for the Rama-Kriol Territory in 2009; however, the Grand Canal Authority intends to ignore that title in the heart of the Rama-Kriol Territory (263 km2), an area upon which these peoples depend for their subsistence. This would be carried out through the so-called “Free, Prior, and Informed Consent Agreement for the Implementation of the Grand Interoceanic Canal of Nicaragua Development Project”. That agreement establishes the duration of the lease as perpetual or “indefinite”, which, in effect, is usurpation in disguise. Additionally, the agreement was obtained under threats, duress, and cooptation of the GTR-K authorities, undermining the autonomy and self-determination of these peoples due to, among other issues, the lack of “good faith” that states must observe in such processes according to ILO Convention 169. The agreement thus presented is essentially fraudulent. Furthermore, on October 29, 2016, President Daniel Ortega handed over an illegal and fraudulent state-sanctioned title to a counterfeit communal government claiming the authority of the Bluefields Creole Communal Government and made up of members of Nicaragua’s governing party. That title covered less than 7% of the territory claimed by the Black Creole Indigenous Community of Bluefields (CNCIB), which was then in the process of titling its traditional territory as guaranteed under Law 445. Through the creation of the fraudulent government, the governing party: 1) weakens the CNCIB’s traditional institutions while developing a title that violates legal due process and leaves out 93% of the lands claimed by the CNCIB in order to enable the GCIN route, thus avoiding a consultation process with the CNCIB on the GCIN route; and 2) enables the usurpation of the position of the duly-elected Creole representative on the National Demarcation and Titling Commission (CONADETI) so that members of the parallel government could take part in the process of drawing up the illegal title for only 7% of the claimed territory. Members of these Indigenous and Afrodescendant peoples brought the case before the Inter-American Commission on Human Rights in 2014 and, between then and 2016, filed 16 writs of amparo before the Nicaraguan Supreme Court of Justice (CSJ), the institution tasked with guaranteeing human rights and basic freedoms to all citizens under the Political Constitution of the Republic of Nicaragua. However, the CSJ still has not responded to several of those writs, and in those cases that it has decided, it has decided against these peoples, in several cases incorrectly interpreting the facts and norms and even explicitly deciding the case contrary to the law. The Petitioners hope that the State of Nicaragua will reflect and take this opportunity to respond to the IACHR in accordance with national laws, the Constitution, and international laws that promote and protect the human rights of these peoples. Two Videos: We do not Consent! VIDEO: We Do Not Consent! “We Do Not Consent” – The Indigenous Struggle Against the Nicaraguan Canal (Sept 2016) from Juice Kitty on Vimeo.